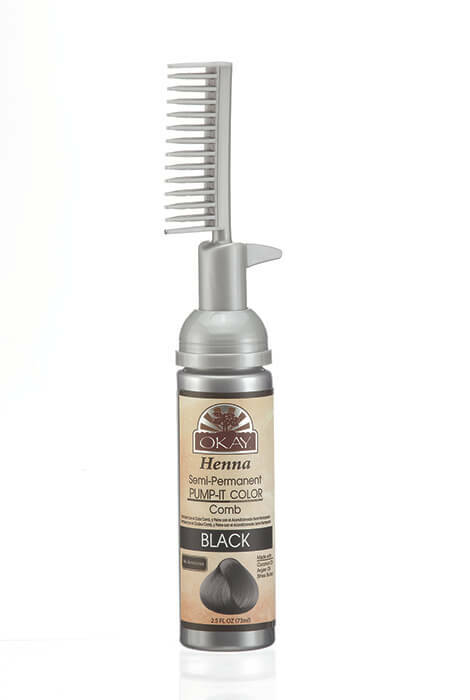 OKAY® Semi-Permanent Pump-It Color Comb provides rich, vibrant hair color and adds nourishing henna properties that leave locks soft and shiny. The easy-to-use hair die comb applicator pump provides more complete color coverage and takes the guesswork out of coloring. 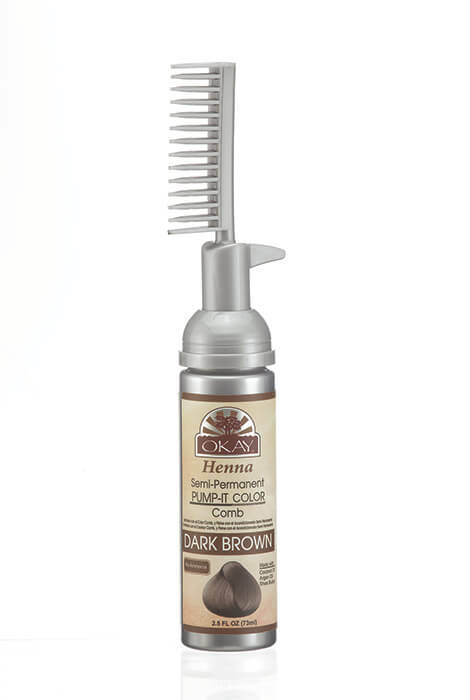 Nourishing henna comb in hair die contains argan and shea butter to condition hair. Contains no ammonia or peroxide, so no harsh chemical smell. To use, apply generously through shampooed, towel-dried hair. Begin by pumping color comb and applying evenly to hair in a combing motion. Let color set for 25 minutes and then rinse. Semi-permanent henna hair color. 2.5 oz. Apply semi-permanent color generously and apply thoroughly shampooed, towel-dried hair. Begin by pumping color comb and applying evenly to hair in a combing motion. Make sure hair is completely saturated from roots to tips. Let color set for 25 minutes. Rinse after..
(Aqua) Water, Brassicamidopropyl Dimethylamine/Cetearyl Alcohol, Glycerin, Persea Gratissima (Avocado) Oil, Ricinus Communis (Castor) Seed Oil, Prunus Amygdalus Dulcis (Sweet Almond) Oil, Cocos Nucifera (Coconut Oil), Butyrospermum Parkii (Shea) Butter, Vegetable Oil (Olus Oil in the EU), Isopropyl, Palmitate, Shea Butteramidopropyl trimonium Chloride, Tocopheryl Acetate Methylchloroisothiazolinone / Methylisothiazolinone, Tetrasodium EDTA, Fragrance.